Caffeine Math: How much caffeine is in a tea blend? For some reason, it seems like I write a lot about caffeine on this blog. My three-part series on the subject is the most popular thing I’ve ever posted. My recent post about theanine talked about caffeine as well. One thing I haven’t addressed in detail is what happens to caffeine content when you blend tea with something else. The first thing we have to do is clear our minds of preconceptions. Remember that there’s no simple formula saying that one kind of tea has more caffeine than another (see my caffeine myths article for details). And resign yourself to the fact that there’s no way short of spending a couple of thousand dollars on lab tests to determine how much tea is in a commercial blend, for reasons I’ll explain in a moment. Let’s start with an example. Assume you have a tea you enjoy. You use two teaspoons of tea leaf to make a cup, and we’ll say this tea gives you 20mg of caffeine. You decide to use this tea in a blend. What happens to the caffeine level? If you blend with other bulk ingredients, the caffeine calculations are simple ratios. If you blend the tea 50/50 with peppermint, then instead of two teaspoons of tea (20mg of caffeine), you’re using one teaspoon of tea (10mg of caffeine) plus one tablespoon of mint (no caffeine). You’ve cut the amount of caffeine in half. If your blend is 1/3 ginger and 2/3 tea, it will have 2/3 as much caffeine as the straight tea. If you’re blending tea with other tea, the ratios work the same way. Blend together two tea styles with equivalent caffeine levels and the result will have the same amount of caffeine as the original tea blends. All of this is contingent upon your measuring techniques. It becomes more complicated if you blend by weight instead of volume. Put together a cup of green tea and a cup of peppermint, and two teaspoons of the blend will contain (about) one teaspoon of tea and one teaspoon of mint. If you put together an ounce of gunpowder green tea and an ounce of peppermint leaves, the result is very different. Gunpowder tea is very dense, and peppermint leaves are light and fluffy. Two teaspoons of that mixture might only have a half teaspoon of tea, which means a quarter of the caffeine. In many commercial tea blends whole ingredients like chunks of berry, flakes of cinnamon, and bits of leaf are more for looks than flavor. Soak a strawberry in hot water for three minutes and you’ll see what I mean. The real flavoring in those blends comes from extracts and essential oils that are sprayed on the tea leaves. In that case, the caffeine content is pretty much unaffected. A teaspoon of flavored tea leaves has the same caffeine as a teaspoon of unflavored tea leaves. A little tea blending secret: sometimes the chunks of fruit in the tea really are chunks of fruit, but they’re not what you think they are. Tea blenders can purchase small chunks of dried apple that are sprayed with (or even soaked in) flavorings or extracts. Your piña colada blend might just be apple bits flavored with coconut and pineapple extracts. There’s very little flavor in the dried apple, so all you’re getting is the flavoring that was added. Why use them at all? Because it’s easy to experiment with, it doesn’t require the tea company to invest in leaf-spraying equipment, and it adds some visual variety to the blend. The chunks can even be colored. The main thing I learned from this exercise is that I don’t have the patience to pick all of the rice out of a tablespoon of genmaicha! The separation I did showed that a tablespoon of this particular genmaicha contained about 1/3 tablespoon of rice and 2/3 tablespoon of sencha. 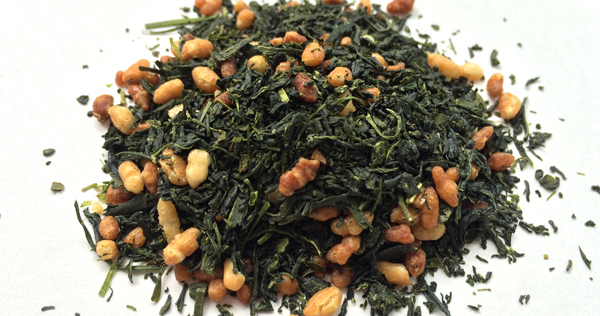 Since rice has no caffeine, that means a cup of this genmaicha probably has about 20mg of caffeine in it. I was going to try the same experiment with a Moroccan mint tea, but found that the one I have on hand has no peppermint leaves. It appears to contain only tea leaves and mint extract. That means it has the same caffeine level as the tea used to make it — in this case a gunpowder green tea. I don’t think you actually have to do much math to estimate caffeine levels. It’s imprecise at best because tea leaves don’t come labeled with their caffeine content. But if you look at a tea blend and it appears to be about half tea leaves and half something else, it’ll have about half the caffeine of the tea alone. Some blends I’ve looked at lately appear to have very little tea leaf — those might as well be decaffeinated tea! Others, like the Moroccan mint I mentioned a moment ago, are almost entirely tea, so treat them just as you would unflavored tea. Posted on 29 December 2013, in Styles & Blends and tagged caffeine, essential oils, extracts, flavorings, genmaicha, Japanese tea, mint, Moroccan mint, oils, peppermint, roasted rice, sencha, tea blending. Bookmark the permalink. Leave a comment.